Tight control of materials is critical for Lockheed's Space Systems Division. New carousels and conveyors, run by sophisticated, easy to maintain controls, give the company what it needs. Inventory accuracy and lot date control are the name of the game for the warehouse that supports Lockheed's Space Systems Division (SSD), Sunnyvale, Calif. Saddled with old equipment and materials spread out in several buildings, Lockheed found the game very hard to play. "We were in four separate areas," recalls material operations manager Dean Heath. "There were lots of disbursements and receipts, and major demands on kitting. And we only had old, two-decker racks. We also had problems with throughput and accuracy." 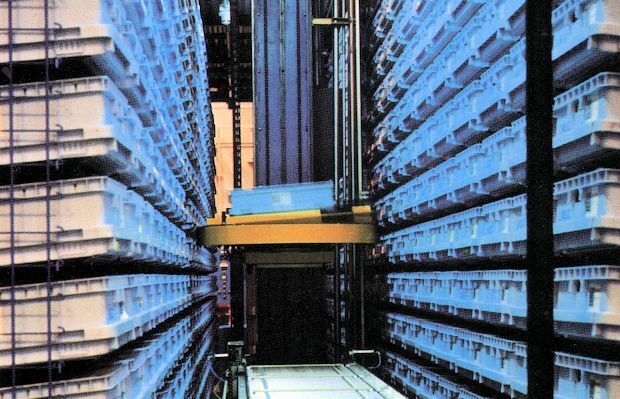 Sixteen automated carousels with a current capacity of 2,400 receiving totes and 70,000 storage locations. Six extractor/inserter units that automatically load and unload totes to incoming and outgoing conveyors. Line shaft conveyors that carry totes throughout the operation. A real time control system that interfaces with upper level management systems. Improved throughput and accuracy are among the benefits of the new operation. Most impressive is the level of control now possible. "The system is intelligent enough to keep track of all materials in the system and deliver them to the appropriate place, based on a set of priorities," notes David Murray, supervisor of SSD stores and material operations systems. "The system is modular and will serve our needs in the future too," adds D.J. Mac Arthur, supervisor, SSD receiving and status control. Before Lockheed personnel even thought about installing automated equipment, they had to get their in formation systems in order. They responded by producing a software system dubbed ARMS (Automated Retrieval and Marking System). 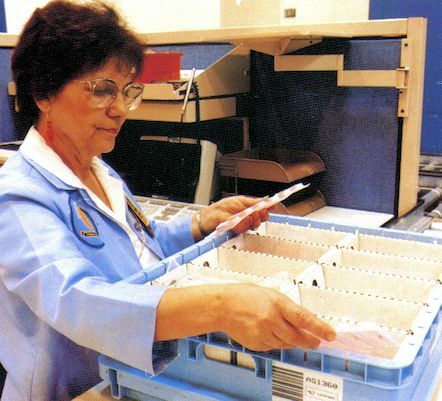 Developed in house and running on a Digital VAX computer, ARMS governs work flow and keeps track of the location and quantity of all stock for the division. Items stored include electrical components, attaching hardware, telemetry equipment, and PC boards-45,000 part numbers in all. "The ARMS software improved our visibility and materials accountability, so we could begin thinking about consolidating and automating materials handling systems," notes Murray. With the information systems in place, planning for automation could begin. A series of weekly meetings, which would continue throughout the implementation of the system, kicked off the effort. The careful planning and open communications that characterized these meetings drove the success of the project according to Heath. Facilities personnel, operations personnel, systems integrator FloStor and subcontractors, were present. All participants discussed just about every imaginable concern and were encouraged to contribute," says Heath, "which helped immensely." The outgrowth of all the meetings and planning is a system that streamlines the flow of both materials and information throughout the facility. Flow begins in the receiving area. For most incoming materials, operators place small items in totes for storage in one of the horizontal carousels reserved for receiving. Larger materials are placed on pallets for storage in racks. Operators place a bar code on the receipt package and type in an identification number through a terminal connected to the ARMS system. From receiving, ARMS sends materials, based on date sequence, to inspection workstations. About 30 percent of incoming items are subject to physical inspection. 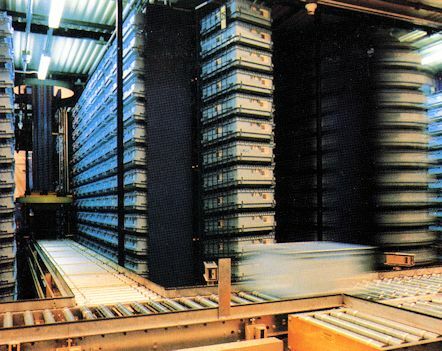 Line shaft conveyors transport these materials to receiving inspection workstations. ARMS workstation terminals can access Lockheed's quality system allowing inspectors to match parts to the latest engineering specifications for use in the inspection effort. Materials that pass inspection move on to a stocking queue. There, an operator scans the tote with a bar code reader, triggering a screen that displays the expected contents. After the operator verifies the contents, the receipt is closed and ARMS adds the stock to its inventory records. Next, the operator must transfer materials to a storage tote. A computer screen at the operator's station shows which locations within the carousel are available. The operator can make a selection or let the computer decide, based on compartment availability, where to store the materials. The sharing of decision making between operator and computer is a characteristic seen throughout the new facility. As a result operators do not have to make complex decisions, but still have the option to use more initiative. When the storage tote arrives, the operator scans its bar code. The computer screen shows a schematic of the compartments in the tote and highlights the one in which the materials should be placed. The operator deposits the materials and sends the tote off to one of the 10 carousels reserved for storage. A robotic extractor/inserter places the totes into the carousel location. Meanwhile the operator sends empty receiving totes back to the receiving area. In one exception to the above procedure, the ARMS system knows if shortages exist for incoming materials. If so, shortages are filled and sent directly to manufacturing pick-up (will call), bypassing the storage step. 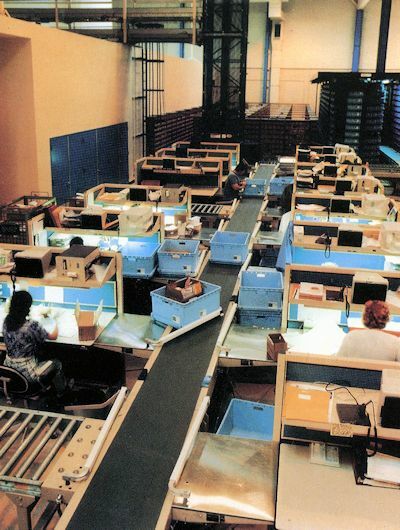 When manufacturing needs materials, an electronic signal is sent to the ARMS System, setting up an order queue. ARMS also tells the system that controls the materials handling equipment (the Tote Tracking System or TTS), when to send a tote. The system maintains a constant workload at each workstation. When a photoelectric cell shows an empty slot at a workstation, TTS directs a tote that way. Robotic extractor/inserter units retrieve the tote containing the appropriate materials from a carousel, place it on the conveyor and send it on to the operator. The operator again scans the tote and checks the workstation computer screen to determine which compartment to pick from. The parts and a pick ticket showing order number, quantity, date, requester, and time are put in a plastic bag. The operator deposits the bag in a tote, and places the tote on a conveyor for transport to manufacturing pick up. In a typical day, five operators process 250 individual disbursements and 25 kits with multiple items. Behind the physical processes at Lockheed's warehouse is an advanced control system. The system provides sophisticated capabilities, yet is easy to maintain. "One of our goals for the controls was to be able to establish priorities early in the receiving process and keep the momentum going all the way through," states Murray. Hashing messages on the terminals tell operators of urgent situations. The system still processes orders on a first-in /first-out basis, unless preempted by other priorities or manufacturing schedules. The system will also relocate totes for efficient use. The software knows which tote will be needed next and where. When the carousel is not otherwise in use, the system moves the tote to a carousel location closer to the point of need. The software also lets Lockheed track different accounts for different programs. Materials may be switched from job to job, but not before personnel examine information on lot date and quantity. Before the new system was installed, personnel physically pulled parts to get the necessary information. The decision-making capabilities of ARMS are linked to the control system that governs the materials handling equipment. The philosophy behind this system is "let computer programmers keep ownership of the application software while giving non-computer, facilities personnel the visibility and tools required to maintain the day-to-day operation of the system." Controllers are plug replaceable units linked on a local area network. Each unit has its own local electrical connections, RS232 port, and direct bar code laser reader, RF tag reader ports, and full local debug capability. Programming for the controllers is done in the C language on a central computer. C is the language of choice for most real-time computing applications. In contrast, programming for many automated systems is done in ladder logic. Ladder logic is easier for floor shop personnel to understand, but less efficient for sophisticated programming. The controllers automatically request application programs from the host computer the first time they are turned on or whenever they detect a malfunction. This feature also allows the central programming team to create changes and move them to the individual controller at will. The control system is virtually fool-proof in operation. For example, the controls will discover a tote incorrectly placed anywhere on the system and correct the situation. Bar codes scanners at the entrance of each of 16 zones detect the presence of totes. The system sends any incorrectly placed tote on to its proper destination. The new hardware and software combination has turned the Lockheed warehouse into a winning team. But the team is already adapting to meet future demands. First, a new level of carousels is being installed above the existing set. The existing robotic extractor/ inserter devices will service the new units, easing the installation process. The additional carousels will allow the warehouse to store fabricated parts as well as purchased items. Software is also evolving. Murray is looking forward to the addition of a pre-screening ability. "I will tell the computer that I need such and such an assembly, how many can you currently make? The components will then be set aside (in the computer) to make sure the parts are there." Heath has high hopes that the facility will continue to evolve to meet whatever demands the future brings.